The much-awaited clash between Manchester United and Arsenal culminated in the Red Devils bagging the victory, the scoreline reading 3-1. Goals from Alexis Sanchez, Jesse Lingard, and Anthony Martial colored the Mancunian side of things, while Aubameyang provided Arsenal with their sole consolation goal. With this victory, United have now progressed into the next round of the FA Cup – a competition that they will now look to win, and will also be a massive factor in determining whether or not Ole Gunnar Solskjaer, now on his eighth consecutive victory since taking charge, will bag the full-time manager’s gig come summer. Amongst the Red Devils’ squad that traveled to London, there was a curious absence. David De Gea wasn’t named anywhere in the squad, as it was Sergio Romero who started the game, while Lee Grant populated the substitutes’ bench. This absence was viewed with some worry by United fans, particularly since the heroics of De Gea were crucial in securing the three points when the Mancunian giants were pinned against Tottenham not too long ago. Fortunately, Romero was adept at the back, although he was unable to maintain a clean sheet and keep out Aubameyang’s well-placed attempt. Regardless, the Spanish shot-stopper didn’t recuse himself from the game entirely, and his Twitter feed was a testament to his role in the game. His tweet reacting to Alexis Sanchez’s opener was one that perfectly encompassed how a majority of the spectators would have reacted to the Chilean’s finish. His subsequent tweets were likewise a celebration of the convincing performance that United put up on the night. 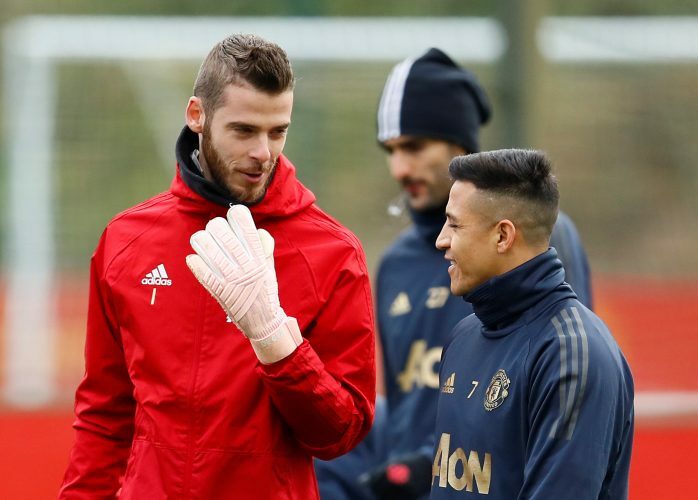 A reemergence of his goalkeeping brilliance as of late has meant the Old Trafford faithful are freshly concerned about the Spaniard’s future. Despite the club activating the 12-month extension clause in his contract, they are yet to agree with him on a full-contract extension, with the wages demanded by him believed to be the sticking point.